The Maricopa County Attorney’s Office is committed to protecting and strengthening our community. One of the ways we do this is by going out into the community, providing safety and prevention awareness, and education. It’s a sad truth, but there is a very clear nexus between drug use and criminal activity. We know that giving people the tools they need to avoid drug use will reduce crime for all of us and will lead to better lives for our residents. Specifically, we’d like to reach kids and give them the tools to resist any pressure or temptation to get involved with drugs in the first place. In conjunction with the 2017 Red Ribbon drug prevention and awareness week, “Your Future is Key to Stay Drug Free,” which ran October 23-31, MCAO representatives went out to schools to talk to K-8 students about the importance of living a drug-free lifestyle. These presentations engage students to actively think about the impact their decisions make on their future as it relates to tobacco, alcohol and prescription drug abuse. Using real-life examples, as well as resistance and stress management strategies, MCAO representatives lead a discussion for students to consider the importance of their choices and the consequences they may have. Because MCAO receives far more requests for these presentations than it can accommodate in a single week, we have scheduled presentations at schools and after-school providers during the entire months of October, November, and into December. We are visiting 13 schools and expect to reach more than 3,000 students with Red Ribbon events this year. During Red Ribbon Week, I had the opportunity to speak at the Governor’s Office of Youth Faith and Families annual “The Elephant in the Room” event, highlighting efforts to reduce drug abuse in Arizona. Arizona is a “treatment first” state and that means that for first—or even second time—drug use or possession offenses, we offer a treatment program in lieu of prison time. If an individual successfully completes the program, the case will be dismissed with prejudice and in some cases, they won't even be charged. Individuals and family members of those struggling with addiction often don’t have the resources to seek treatment or don’t know where to go. 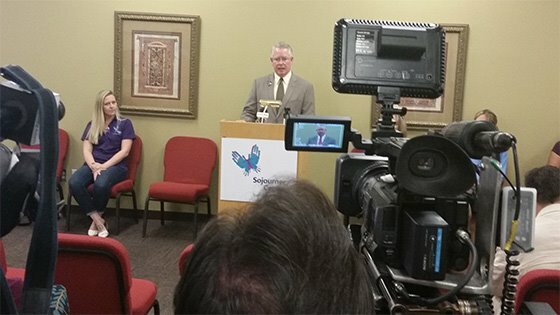 Nearly a year ago, the Phoenix Police Department, with support from the Governor’s Office of Youth, Faith and Families, initiated a pilot program in the Maryvale area to address this need with the Arizona Angel Initiative. This initiative allows individuals who have a drug addiction to come into a police precinct, turn in their drugs, and get help without fear of arrest or prosecution. Participants are paired with a peer-support trained Angel who evaluates the unique circumstances and needs of each person to find an appropriate recovery center. Participants receive education on life skills and solutions to break the cycle of addiction and achieve recovery. Because of the success of this pilot program, the Scottsdale Police Department has announced it is launching the program in its jurisdiction. This is a great step toward giving more people, more families, the opportunity to access the help that they need. We look forward to the program spreading throughout the County. Friday Night Football Patrol just ended a record-breaking 7th season. MCAO partnered with KISS FM to bring the program to ten schools around the County. 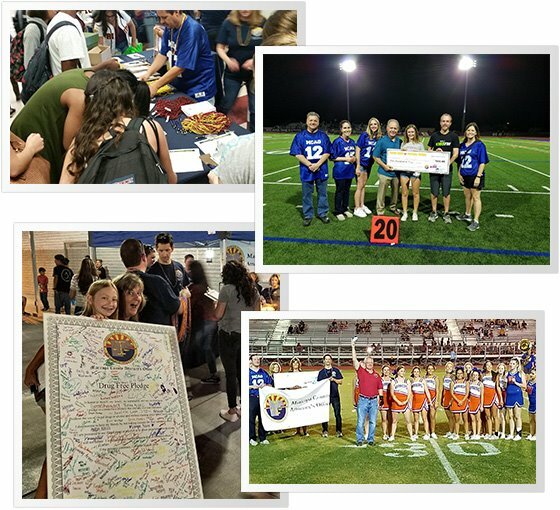 Thanks to MCAO staff and student volunteers at each school, we helped 14,150 students around the Valley sign the pledge to stay drug and alcohol free. That’s a 61% increase from our 2016 total! We visited the schools during lunch time on game day and then were back for the game handing out pledges and beads in each school’s colors. Students who signed the pledge were eligible for a $50 gift card drawing at lunch and a $500 gift card drawing at halftime. We extend our thanks to the Arizona Milk Producers for their sponsorship. This year’s FNFP featured a competition between all ten schools we visited. Thanks to Papa John’s Pizza, the school with the most pledges signed and the school with the highest percentage of pledges signed were awarded a pizza party. The winning school for total number of pledges signed was Perry High School in Gilbert at 2,097 pledges. For highest percentage signed, Centennial High School in Peoria was the winner with 1,843 pledges signed, which represented 87.47% of the student body. Maricopa County has been using Geographic Information Systems (GIS) mapping for years. Departments like Flood Control, Transportation, the Stadium District, Planning and Zoning and Animal Control use GIS to help with creating reports, customer service calls and geographic information sharing. And now the Crime Strategies Section at the Maricopa County Attorney’s Office is taking advantage of this important intelligence-based component to not only provide our prosecutors with visual aids for trials, but also as a way to create reports and maps that include crime trends and crime series information. Geographic characteristics of cities, towns and neighborhoods in Maricopa County have been added to police report data and submittal information. A GIS mapping application is an effective way to analyze where crime occurs, and is a starting point for understanding why and how it occurs. 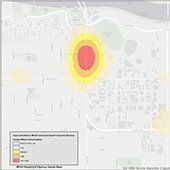 The addition of GIS mapping to crime analysis offers the potential to identify crime migration of priority offenders in Maricopa County and enhances information sharing with law enforcement. 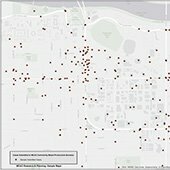 Most people are aware of GIS mapping techniques used by police departments for analysis and information sharing, but only a handful of prosecutors’ offices, including MCAO are now also cultivating this expertise. Two of our crime analysts attended nearly 40 hours of crime analysis mapping training, followed by one analyst attending the Annual ESRI User Conference. ESRI is a California-based company that produces GIS system software, web-based GIS and geodatabase management applications. The analysts learned about and were inspired by a multitude of mapping applications, specifically those that could be applied to crime analysis here at the MCAO. Crime mapping assists prosecutors in making data-driven decisions in support of crime reduction strategies and helps keep them informed of emerging crime trends in their geographic-based bureaus. GIS mapping is an essential part of the MCAO crime strategies toolkit. It creates valuable, beneficial information and improves critical decision-making – while having a direct and positive impact on our community and the criminal justice process. While the recent focus on concussions has been mainly on athletes, there is a group with a similar or even higher risk of injury… domestic violence victims. One in four women will experience domestic violence in her lifetime. A 2001 Journal of Emergency Medicine survey of metropolitan emergency departments in Dallas and Los Angeles found that 67% of women seeking medical care related to a domestic violence incident had symptoms associated with concussion. These victims have an elevated risk for concussion because domestic violence often includes violent acts, such as choking, blows to the head or being forcibly shaken. Starting in November, the Maricopa County Attorney’s Office is partnering in a new local study to measure the frequency of concussions inflicted during domestic violence incidents. 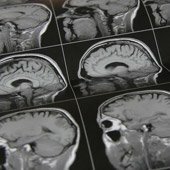 This groundbreaking collaboration will bring together members of law enforcement, the medical community, and researchers to develop a greater understanding of and assist in identification, and treatment of concussions in the context of domestic violence. The study will begin with data collection by the Mesa Police Department. Officers will be trained to use a small handheld device to measure oculomotor, or eye tracking data of domestic violence victims. The measurement taken by the officers, along with subsequent medical exams will help identify abused individuals suspected of having a concussion. This identification will allow victims the opportunity to receive better medical care through a large network of collaborators and providers. While the first goal of the study is to determine the frequency of concussions in this population, the second goal is to offer an increased level of care and treatment to the victims. The data will also allow study partners the ability to develop “best practices” aimed at improving the lives of victims. Through these identified “best practices,” medical providers will be able to offer better care to patients by recognizing when they show signs and symptoms of concussion. Law enforcement will better recognize and address concussion in domestic violence cases and prosecutors can develop enhanced prosecution strategies for abusers who cause these injuries. Fellow study partners include; the CACTIS Foundation, HonorHealth, the Mayo Clinic, the University of Arizona-College of Medicine-Phoenix, Conquering Concussions LLC, and Barrow Neurological Institute at Phoenix Children’s Hospital. Additionally, evaluation of the first year of data will help determine whether existing criminal statutes capture the criminal conduct involved in these types of injuries or if a new statute is needed. To help raise awareness surrounding the issues of domestic violence, the Maricopa County Attorney’s Office created a social media campaign on Twitter and Facebook throughout October. The messages offered statistics, facts, provided resources for victims and encouraged victims and their loved ones to seek help. In 2015, there were 107 domestic violence-related deaths in Arizona. This is an issue that affects more than 12 million people each year. Victims are from all different races, ages, genders, ethnicities, and socioeconomic classes. During the month-long campaign, the Office also partnered with the Sojourner Center, The Arizona Humane Society and Lost Our Home Pet Foundation, organizations that offer programs and provide shelter to pets fleeing a domestic violence situation. For many victims of domestic violence, fear for the safety of their pets delays them from leaving a dangerous situation. Pets are often used by abusers as a means of control over their victims. 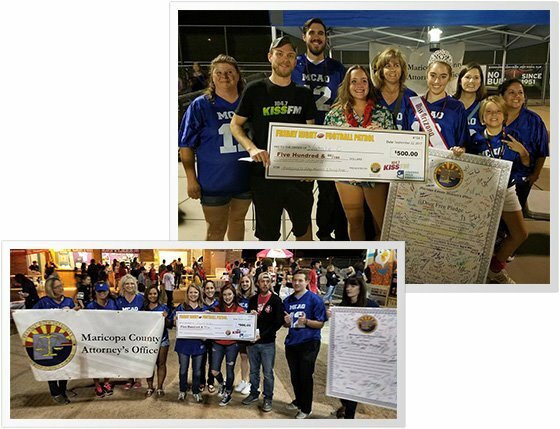 Through our partnership with these organizations, MCAO not only helped raise awareness around domestic violence issues, but also helped organize a pet supply drive to stock shelters assisting domestic violence victims. 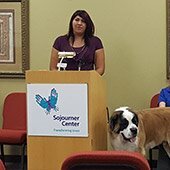 Since the campaign began, there have been new pet intakes at the Sojourner Center and many calls inquiring about the program. This campaign has provided domestic violence victims with the resources and encouragement they need to seek help. To stay up to date with MCAO and to review the campaign’s efforts over the last month, please follow MCAO on Twitter and Facebook. Last month, the Morrison Institute hosted a roundtable discussion on the death penalty with four panelists, including Maricopa County Attorney Bill Montgomery. Rick DeBruhl from the State Bar of Arizona moderated the two-hour event that also featured former presiding judge Colin Campbell, Susan Corey with the Maricopa County Legal Advocate’s Office and Arizona Representative Maria Syms. After an opening statement from each panelist, DeBruhl posed four questions and encouraged dialogue among the group. In the last 20 minutes, questions were also taken from the nearly 100 attendees in the audience. 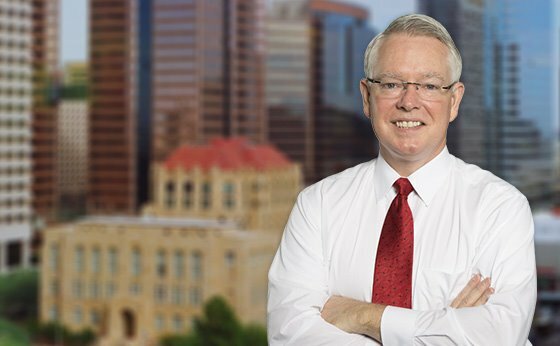 As Maricopa County Attorney, Bill Montgomery is responsible for the decision on whether to seek the death penalty in appropriate cases. 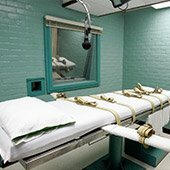 The decision to seek the death penalty depends on the circumstances of the crime and aggravating factors. The actual decision-making process involves a multi-phased analysis. First, is there sufficient evidence to establish the identity and degree of involvement by the defendant to cause a jury to unanimously find beyond a reasonable doubt that the defendant is guilty. Second, is there sufficient evidence for a jury to unanimously fine one or more aggravating factors to render a defendant eligible for the death penalty. Third, is there sufficient evidence for a jury to unanimously conclude the defendant's mitigating evidence does not call for a sentence other than death. Finally, is the murder in question the type of murder where the death penalty is a just punishment. Very few murders ultimately satisfy all these requirements. In Maricopa County, the death row population has been declining since 2010 and County Attorney Montgomery attributes some of that decline to decreases in the types of crimes that might lead prosecutors to seek the death penalty. “Although recent crime rates show an increase in violent crime, it is still over 30% less than the highest historical violent crime rate almost 25 years ago,” said County Attorney Bill Montgomery. It’s Records Personnel Appreciation Day! A few months ago, MCAO became the largest prosecutor’s office in the country to transition their criminal functions from paper files to digital. This switch to electronic files increases the Office’s overall efficiency and ability to access information quickly. But just because the MCAO is digital doesn’t mean we don’t have records and files to organize and maintain. In fact, the Office is still home to millions of records, including criminal and civil case files, human resources material, financial information and grant records – to name just a few. And to manage all these paper and digital records, the MCAO has teams of Records Managers, Information Technology experts and Public Records gurus, not to mention our prosecutors and support staff who are trained on proper disposition of records, capturing and maintaining proper information, and effective records management. In recognition of these criminal justice and law enforcement records magicians, Governor Doug Ducey has proclaimed Thursday, November 9, 2017, as Law Enforcement Records Personnel Appreciation Day in the state of Arizona. In this first-ever state-wide recognition of law enforcement records experts, the proclamation declares that law enforcement personnel throughout Arizona are crucial to helping agencies identify and process criminal offenders while maintaining a valuable contribution to our criminal justice system. MCAO recognizes and thanks all the “Records Royalty” in our Office for everything they do, their expertise and experience managing the “digital divide” and ensuring that our crucial sources of information are categorized, cataloged and maintained. Thank you! 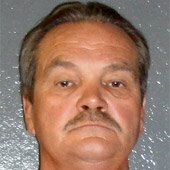 Raymond Hanley received a life sentence plus 10.5 years, for 1st degree murder and arson in connection to the death of 40-year-old Debra Kay Shipton who was found brutally bound and killed inside her Mesa apartment in 1993. Nothing can change the suffering the victim and her family had to endure from the events of that day, but this sentencing demonstrates the resolve of the Maricopa County Attorney’s Office in holding defendants accountable and seeking justice no matter the passage of time. Copyright © 2017 Maricopa County Attorney’s Office. All Rights Reserved.